Covers: Mountboard covered in fabric mounted onto paper. End papers: Arches Expressions paper, sponged with paste, coloured with acrylic and gouache, with glycerine. Flyleaves: Tissue paper. Sections of A4 sheet of paste paper, layered first with paste, then dark blue pastel, then paste with antique silver Pearl-ex added, streaked over top. Blue text word-processed; silver text hand-written with Mitchell nibs and FW acrylic. Shapes highlighted with Edding crystal jelly pen. 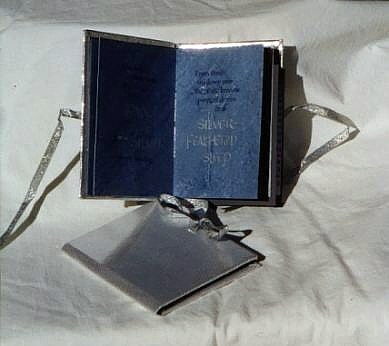 Folded origami book sewn with metallic thread.